Moving very slowly on the new graph layouts. I think I've got a system worked out, so the next eight four conversions shouldn't take too much longer. 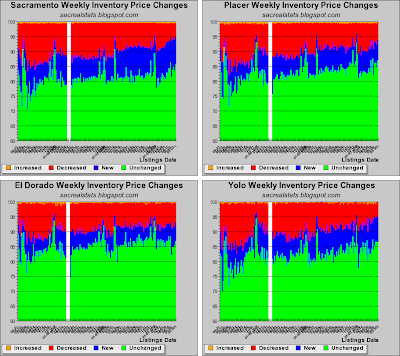 As for the data, I'd like to point out an interesting trend on the "Weekly Inventory Price Changes" graph. 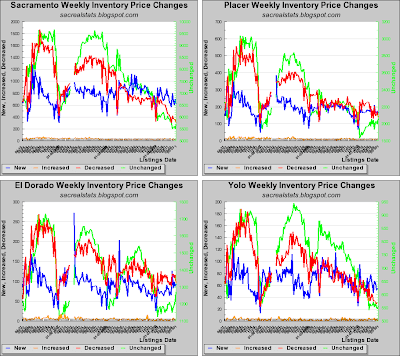 It appears that fewer and fewer listings are showing week-over-week price drops, which is a sign (to me at least) that sellers are finally setting reasonable selling prices at the beginning of the process. This could merely be a function of the rationality of the seller (mostly banks), or a desire to sell the house quickly. Whatever the cause, it's a broad sign that sellers are finally reading the market accurately. 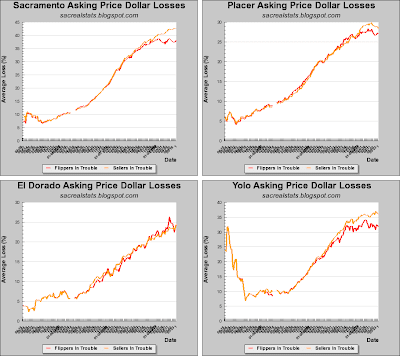 check your Asking Price graph. 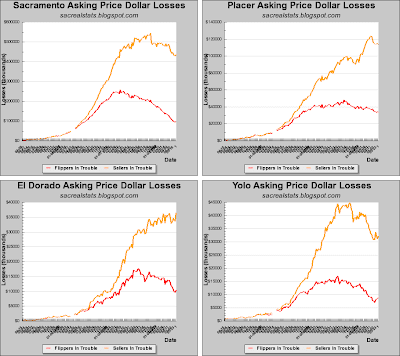 The Eldorado County graph seems wrong. Possibly SqFT and average price are switched? A couple other graphs tripped me up too. They look OK to me. EDC median = $400K, avg = $525K, $/sqft = $221. EDC has a big median/average spread due to the large number of million dollar houses. my bad, read it wrong.